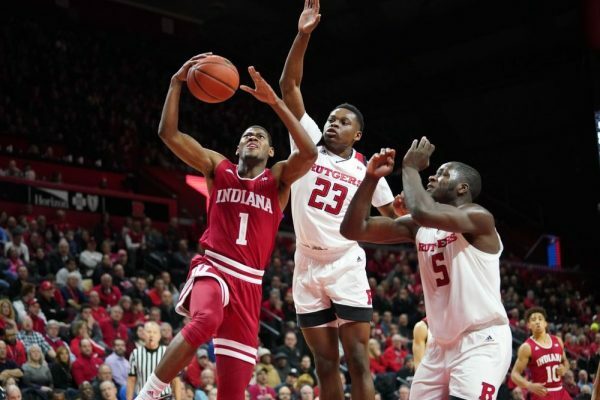 BLOOMINGTON, IN – Nearly one year ago to the day, Archie Miller‘s first season as IU’s basketball coach concluded with a stunning 76-69 loss to basement-dweller Rutgers in the Big Ten Tournament at Madison Square Garden. The Hoosiers blew a 17-3 lead, and Miller called Rutgers the tougher team that night. Any sort of postseason dream was snatched from the Hoosiers grasp; forget the NCAA Tournament, IU lost hope of even making the NIT. Fast forward 372 days later, and IU is writing a different ending to its season’s story. The Hoosiers (17-14, 8-12 B1G) knocked off Rutgers 89-73 on Senior Day, recording their fourth consecutive win, and picking up steam heading into the Big Ten Tournament, and, potentially, the NCAA Tournament. In his last game at Assembly Hall, star forward Juwan Morgan started the festivities by making his first 10 field goal attempts, which would have set a school record for most field goals without a miss, set by Will Sheehey (9-9 vs. Purdue in 2013). Morgan ended the day shooting 11-13, with 25 points and 7 rebounds. After spotting Rutgers the game’s first five points, IU took over. The Hoosiers took the lead at the 16:43 mark of the first half and never relinquished it. Even though starters Robert Phinisee, Justin Smith, and Morgan each picked up two fouls in the first 13 minutes of the first half, Romeo Langford and Devonte Green stepped up to help the Hoosiers’ cause. As a team, IU turned it over merely twice in the first half, a far cry from their season average of 12.7 per game. Also, the Hoosiers flourished at the free throw line, making 15-18 before the break. Green led the team with 12 points in the first, mixing up effective jump shooting with drives to the rim. Langford controlled the game on both ends, grabbing four rebounds and getting to the free throw line five times. Rutgers had no answer inside for IU’s frontcourt. The Hoosiers shot 14-21 inside the arc, as Morgan and De’Ron Davis combined for 17 points, missing only one basket before halftime. Race Thompson chipped in with a couple rebounds and a blocked shot in the first half. After the intermission, IU kept the pedal to the metal. Rutgers never came within nine points, as they fell to their largest defeat since January 15 at Purdue. Robert Phiniseedid his thing on defense, suffocating sophomore guard Geo Baker, limiting him to just five points on the day. Perhaps more impressive was that Baker was only able to attempt four field goals, committed three turnovers, and only got to the free throw line twice. Every Rutgers starter finished negative in the plus-minus category, and only Ron Harper, Jr. did better than -13. Conversely, IU’s starters all recorded +15 or better, led by Romeo Langford’s +27. The two stars, freshman Langford and senior Morgan, asserted their dominance down the stretch, and never gave Rutgers a chance. They combined for 26 points after the break, and Rutgers looked helpless in defending them. The Hoosiers received useful contributions from their bench throughout the game, as they accounted for 25 points, led by Green’s 16 and Davis’ 7. If the Hoosiers can get consistent production from those players, anything is possible in the games to come. It was heartwarming to see all sixteen players (sans the redshirted Jerome Hunter) enter the game for IU today, including seniors Quentin Taylor and Johnny Jager, who played their final games at SSAH. Notable statistic: Indiana recorded 1.309 points per possession today, one of their most efficient offensive performances of the season. Next up, the Hoosiers will take a trip to the United Center in Chicago, IL, for the Big Ten Tournament. Based on the result of games later today, the Hoosiers will take on either Ohio State or Minnesota on Thursday, March 14th, at 12:30 PM on BTN. A win in that one could cement the Hoosiers’ place in the Big Dance.